*Applies to genuine cruise quotes from all cruise lines and other registered businesses and websites. Quote must be in writing and must be presented to us prior to booking. Price must be available and able to be booked by New Zealand passport holders and New Zealand residents when you bring it to us. Price must be available to the general public. Prices available due to membership of a group or corporate entity or subscription to a closed group are excluded. Quote must be for the same dates, ship and cabin class and with the same inclusions. We will beat the price by $1 per person. Sail Free Guarantee - why book anywhere else? 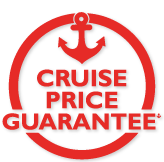 When it comes to cruises, we are so sure we will not be beaten on price that if you find a cheaper available cruise quote and we don't beat it, we will give you your cruise for free. How can I Sail Free? As long as the same cruise fare and same cabin class is available, Flight Centre will beat any genuine written cruise quote by $1 per person. Your quote must be in writing and must relate to standard cruises available to New Zealand passport holders and New Zealand residents. Your genuine written quote must be presented to us prior to booking. Does not apply to prices from Flight Centre’s own website. Your consultant will need to confirm that the quote is genuine, current (able to be replicated by us when you present it to us), available and able to be booked by New Zealand passport holders and New Zealand residents when you present it to us. If it is, we will beat it by $1 per person. IMPORTANT – for quotes in foreign currency, where the qualifying criteria are met, we will beat the foreign currency price by a NZD$1. For quotes in foreign currency, conversion to New Zealand dollars will be based on the rate of the day as per the Westpac currency converter https://www.westpac.co.nz/fx-travel-migrant/foreign-exchange-and-international/currency-converter/. The final New Zealand dollar amount you pay will vary depending on when you make your payment and the rate of exchange on that day. Regardless of when you make your payment, Flight Centre will have beaten the original foreign currency quote. You will be required to book your cruise when we beat your quote, pay a deposit or in full and normal change and cancellation conditions will apply. If the same quoted product is not available, or the quote is invalid or incorrect, we will endeavour to find you the best available alternative that suits your requirements. Price must be available to the general public. Prices available due to membership of a group or corporate entity or subscription to a closed group are excluded. If we are required to beat your cruise quote and we don't then you Sail Free! Your consultant will do everything they can to beat the cruise price you have been quoted. If the qualifying criteria are met we will beat that price by $1 per person. If the qualifying criteria are met and your consultant does not beat your quoted price, you will receive your cruise free of charge. You must make your free cruise claim within 7 days of your quote not being beaten. The free cruise will be booked and paid for by us and will be identical to the one you have asked us to price beat. We do not reimburse customers for cruises they have purchased elsewhere, nor do we provide them with cash or vouchers to the value of the cruise we were asked to price beat. Despite anything else in the cruise line’s terms and conditions, you cannot cancel your free cruise and claim a refund.